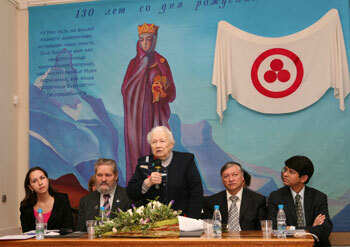 On October 8-11, 2009 the International Centre of the Roerichs hosted the International scientific and public conference dedicated to the 130th birth anniversary of Helena Roerich, the outstanding Russian thinker, philosopher, writer, and public figure. Organizers of the conference: The International Centre of the Roerichs, The Institute of History of Science and Technology named after S.I. Vavilov of the Russian Academy of Sciences, The Russian Academy of Natural Sciences, The Russian Academy of Cosmonautics named after K.E. Tsiolkovsky, The Charitable Foundation by name of Helena Roerich, The International Association of Peace Foundations, The International Humanitarian Foundation “Znanie (Knowledge)” named after K.V. Frolov, The International League for the Protection of Culture, Master-Bank. 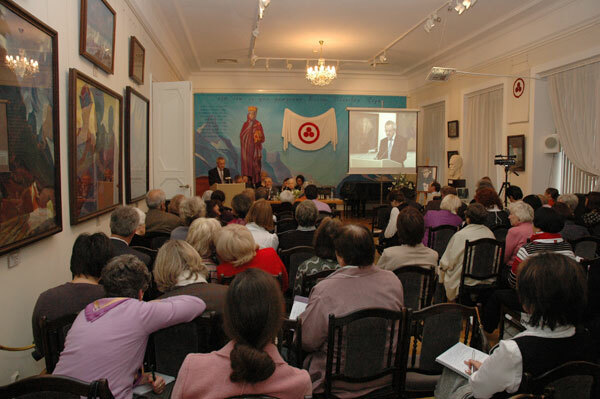 Media Sponsorship for the Conference was provided by the Information Centre of the United Nations in Moscow, «Novaya Gazeta», «Culture and Time» magazine, «Science and Religion» magazine, «Asia and Africa» magazine, «Voice of Russia», Trading House «Biblio-Globus», «Museums of Russia» internet portal. The Conference was welcomed by O. Morozov, First Deputy Chair of the State Duma of Russia; Y. Laptev, adviser to the President of Russia; V. Chereshnev, Chair of the Committee for Science and Science-Intensive Technologies of the State Duma of Russia; A. Dzasohov, Chairman of the Federation Council Commission on Culture; A. Tyagunov, Deputy Chairman of the State Duma Committee on Culture; A. Aparina, deputy of the State Duma of Russia, Chair of the all-Russian Women's Union «Hope of Russia»; V. Afanasyev, cosmonaut, Chairman of the International League for Protection of Culture, Hero of the Soviet Union; V. Zaitsev, Academician of the Russian Academy of Natural Sciences; A. Gorelik, Director of the Information Center of the UNO in Moscow, Alisia Rodriguez, Chair of the International Committee of the Banner of Peace associated with UNO, Z. Valeeva, Deputy Prime Minister, Minister of culture of the Republic of Tatarstan, V. Ploskikh, Academician, Vice-President of the Kyrgyz National Academy of Sciences, Director of the Institute of the World Cultures; V. Nifadyev, Doctor of Sciences, Academician, President of the Kyrgyz and Russian Slavic University; A. Fedotov, Professor, Doctor of Sciences, Chairman of the Higher Attestation Commission of Bulgaria; G. Angelov, Director of the Center of Science and History of Sciences of the Bulgarian Academy of Sciences; L. Tanyuk, People's Artist of Ukraine, Professor, Chairman of the National Theatre Union of Ukraine; Nil Ushakov, Chairman of the State Duma of Riga and others. 450 delegates from Austria, Belorussia, Bulgaria, Germany, Israel, India, Italy, Kazakhstan, Kyrgyzstan, Latvia, Lebanon, Lithuania, Moldova, Russia, Tajikistan, Usbekistan, Ukraine, Finland, France, Estonia took part in the Conference. The Conference also hosted the jubilee exhibition «To live on the Earth touching the Sky...» dedicated to Helena Roerich, representing drawings by Helena Roerich, her personal things, relics and books, as well as photos and documents from the memorial funds of the ICR. One more exhibition, opened on September 13 in Altai region, was dedicated to the opening of the Monument «To Nicholas Roerich from the People of Altai». The event, timed to the 135th birth anniversary of Nicholas Roerich, was arranged in the framework of the International cultural and educational project «Parade of Indian and Russian Creative Heritage» organised by the State Duma of Russia Committee on Culture in non-profitable partnership with «The World of Traditions».